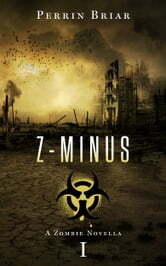 The first novella in a brand new zombie trilogy. Once bitten, the virus spreads throughout the human body. It shuts down organs, kills nerve impulses and even reprograms the way we think. The virus becomes us. But the process takes eight hours. If you only had eight hours left to live, what would you do? For Chris Smith, that decision has already been made. He’s infected, and returns home to find the rest of his family undead or missing, save his youngest daughter Maisie. He’s never been much of a father, but can he make up for it now in the final few hours of his life and find somewhere safe for her to survive? Z-MINUS. Let the countdown begin. This was a good book I'd read the other installments as they come out and I'd also recommend this book to other people to read! The zombie apocalypse stuck Great Brittan​. A down on his luck drunk wakes in his crashed car. When he gets to his house, he finds his daughter and then his wife with knives in them but they suddenly come to life. In fighting to escape, his daughter sneezes on him. As he runs outside he finds the whole neighborhood has become the walking dead, except for his other daughter, the 8 year old one. Finding out he has 7 hours to live normal he tries to abandon her but decides to take her to a relative. What follows is his last 7 hours as a human and not a zombie as he tries to protect his daughter. I am not a big zombie fan but I recently read one of the authors other books. I enjoyed this book. It shows the pain of alcoholism as well as how it starts under the story of the end of the world. It is part of a series but it clearly has a finish point in the book, we are not really left hanging. Except for the violence, which could be strong for the children (at one point the father uses a motor car to take out zombies) this book could be read by anyone. If you enjoy zombie books this could be an interesting read.